The lion’s share of uranium is traded under long-term contracts between uranium producers and utilities companies. The rest is sold on the spot market. The primary driver of the demand for uranium is the capacity of nuclear reactors used to generate electricity. Industry experts project that, given the number of new reactors planned and the world-wide growing demand for electricity, the demand for uranium will grow significantly over the next decade. Only freshly-mined uranium may satisfy the growing demand. The current annual global consumption is 190 million pounds, while annual global mine production is 140 million pounds, resulting in a 50-million pound deficit. Inventory draw downs and the down-blending of weapons-grade material currently make up the difference. Industry experts, however, project that the supply of these secondary sources will decrease by 50% over the next decade, while global demand for uranium will increase, widening the supply-demand gap. Only primary sources of uranium—i.e., the supply produced from mines—can make up the coming shortfall, because the stockpiles will be gone. The World Nuclear Association predicts that by 2020, mined production will account for 90% of global uranium supply, compared to 75% today. For more information, see this Forbes article. There are 439 operating nuclear power plants in the world, and 62 new plants are currently under construction. In the next two decades, China, India, Russia, Europe, the Middle East and Southeast Asia will dramatically expand their use of nuclear energy, causing fierce competition for mined uranium. According to the World Nuclear Association, 139 new plants are in the planning stage and 326 new plants are in the proposal stage. China will build 50 new reactors by 2030 (500% increase), and India will build 35 (150% increase). By 2020, China alone will consume the equivalent of one-third of today’s global uranium market. China and Russia have already begun aggressively buying up huge stakes in uranium mining operations around the world in order to stockpile uranium to meet their rising domestic demand. The Nuclear Regulatory Commission is currently reviewing applications for 31 new reactors in the U.S, roughly equivalent to one-third of the current U.S. fleet. Nine of those reactors are already in the planning stage, and three are in the construction or pre-construction stages. Most of these reactors are expected to come online between 2020 and 2030. By the end of 2011, $18 billion in nuclear loan guarantees will have been awarded to three proposed reactors. The Obama administration is seeking an additional $36 billion in guarantees to accelerate development of as many as five more reactors. The U.S. Department of Energy projects that U.S. electricity demand will rise 24 percent by 2035. According to the Nuclear Energy Institute, even with conservation and efficiency measures, the U.S. will need hundreds of new power plants from a diverse portfolio of fuel sources to supply electricity to maintain high living standards and promote domestic economic growth. Maintaining nuclear energy’s current 20 percent share of generation would require building about one reactor per year starting in 2016, or 20 to 25 new units by 2035. After the incident at Fukushima in spring 2011, the global enthusiasm for nuclear power diminished somewhat. However, according to NuCap Ltd., a London-based industry consultancy, the annual consumption of uranium will increase to 265 million pounds in 2020 versus their pre-Fukushima projection of 320 million pounds per year. Thus, even after the Japan incident, the supply-demand gap is expected to widen significantly. There is an almost inexhaustible undeveloped supply of uranium existing the world over, but there is a limited supply of uranium that can be extracted at a reasonable cost. For instance, uranium could be extracted from seawater at approximately $250-$300 per pound. In comparison, some of the new mines in Africa are expected to have a production cost of $45 to $50 per pound, and some mines can produce uranium for as little as $12 per pound. Typically the lead time for bringing a new uranium mine on line is about ten years. It is conceivable that major shortages could occur in the short term, despite there being ample amounts of uranium in the earth’s crust. In other words, a major supply disruption won’t be corrected quickly because it takes years to finance and build a uranium mining and milling facility. Generating 20 percent of the U.S.’s electricity, the U.S.’s 104 reactors consume 55 million pounds of uranium each year, a full 25 percent of the global supply. However, the U.S. produces less than 5 percent of the global supply and imports over 90 percent of the uranium it uses. The U.S. supply comes from various foreign countries, which may be seen in the chart below. Under the megatons-to-megawatts agreement, the U.S.’s uranium purchases from Russia have consisted entirely of uranium recycled from decommissioned Soviet warheads. This agreement did serve U.S. national security interests for nuclear non-proliferation. However, that agreement expires in 2013, at which time U.S. utilities will purchase Russian uranium from the country’s state-run nuclear company, Rosatom, and its affiliates. This uranium will be sourced from mines, not decommissioned warheads, and will therefore cease to serve any national security interest. Reliance on the Russian state-run nuclear company for U.S. nuclear fuel supply poses serious challenges in terms of U.S. energy security. For instance, in the winter of 2008-09, the Russian state-run natural gas company, Gazprom, suddenly cut off all natural gas exports to Eastern Europe for more than a month, leaving millions of homes without heat or electricity in the middle of one of the harshest winters in recent history. The 1970s OPEC oil embargo is another cautionary example of the inherent risks associated with overreliance on energy imports from foreign state-run energy companies. The potential dangers of overreliance on foreign supplies in an increasingly competitive global market are also highlighted by China’s possession of the global supply of rare earth metals. China has spent the past few decades seeking to monopolize control of these vital materials and now controls 97 percent of the world’s supply. Embargoes of these metals to Japan and Western countries in late 2010 caused severe disruptions in several major industries, including the manufacturing of solar technologies and most high-tech electronic devices. 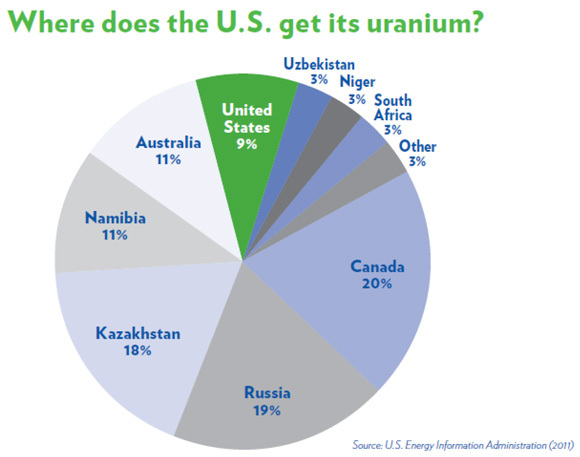 Given the growing demand for electricity and the number of new reactor builds planned, it is likely that the markets for uranium will only grow fiercer, placing the U.S. in a precarious position indeed if it does not develop domestic uranium deposits.